Pakistan's information technology exports have bucked the nation's declining exports trend with double digit growth to reach $1,065 million in fiscal year 2018, according to the State Bank of Pakistan. It is generally believed that Pakistan's central bank underestimates technology exports. Some have argued that the actual IT exports were closer to $5 billion in fiscal 2018. Some of the differences can be attributed to the fact that the State Bank IT exports data does not include various non-IT sectors such as financial services, automobiles, and health care. 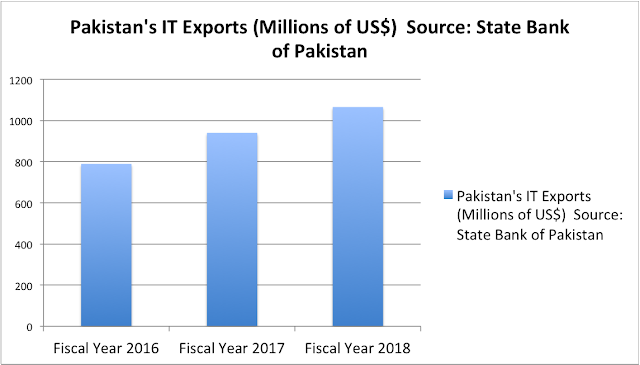 Pakistan IT exports surged 13.4% to $1.06 billion in fiscal year 2018 from $939 million in fiscal year 2017. The growth was even more robust in the prior year with IT exports rising 19.1% from $789 million in fiscal 2016 to reach $939 million in fiscal year 2017. About $320 million of IT exports revenue in fiscal 2018 came from software exports while the rest was made up of services such as consulting, telecom and call centers. Freelancers in Pakistan are benefiting from the growing access to broadband connections which are now being used by over 50 million Pakistanis across the country. 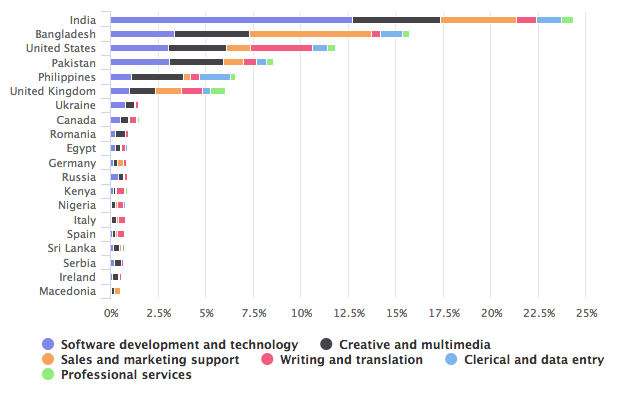 Pakistan is ranked 4th in the world by the freelancing industry report. The country has rapidly increasing human capital of technologists. Growth in IT exports is a good sign for Pakistan's export diversification beyond commodities such as textiles and food. In addition, air forces of about a dozen developing nations are buying and deploying Pakistani made aircrafts. The reasons for their choice of Pakistan manufactured airplanes range from lower cost to ease of acquisition, maintenance and training. Can Pakistan Avoid Recurring BoP Crises? Experts stressed the fact that Pakistan is currently going through a rapid transformation towards digital and technological domains which requires identifying current problems, upcoming challenges and proposing solutions. These views were expressed at a panel discussion organised by PlanX Technology Accelerator, a project by the Punjab information Technology Board (PITB) on Saturday. The theme of the session was ‘The Future of Incubators and Accelerators in Pakistan’. Panelists included PITB Entrepreneurship Director Atif Mumtaz, NSPIRE Technology Incubator Head Ayub Ghauri and UET Technology Incubator Programme Manager Farhan Riaz who proposed solutions to the challenges being faced by stakeholders. Experts discussed the situation of entrepreneurs and relevant stakeholders including the future of incubators and accelerators in Pakistan. PITB Entrepreneurship Director Atif Mumtaz, who is spearheading the board’s entrepreneurial projects, highlighted the past achievements of the board’s entrepreneurship wing. He stated that Plan9 and Plan X have become common knowledge among university and college students. “Due to the fact that there is a lack of jobs in the market, students have started coming up with their own business ideas in the form of start-ups,” he said. This is a big achievement and has helped to tackle unemployment in the country. It is encouraging to see investors supporting such ideas and playing a key role in promoting entrepreneurial activity, he added. NSPIRE Technology Incubator Head Ayub Ghauri maintained that in addition with opening more institutions such as incubators and accelerators, it is also important for start-ups to think outside of the box particularly during the development stage. “This out of the box thinking can help identify sustainable business ideas which can function in the long run,” he added. Panelist also gave examples of successful start-ups which have gone through incubators and accelerators and highlighted the importance of learning from failures. Mughees Tahir, from PlanX, highlighted that entrepreneurs were likeminded people with similar goals and even similar problems; Pakistani start-ups should help each other in order to grow. The panel discussion was followed by a question and answer session from the audience. I think Imran Khan needs a tailored pitch for investors that focuses on opportunities offered by Pakistan, not its problems. And the opportunities should be explained in a way to attract investments in sectors that export higher value manufactured products, not commodities. The IT exports are only a billion dollars now but these are growing in double digits and already account for the third largest export category after textiles and food items. IT exports are also the fastest growing segment of Pakistan's exports. And the potential for IT exports goes far beyond the BPO business. Imran's investment pitch needs to be very different from his political campaign speeches designed for domestic audiences. Despite a slight dip in overall textile exports, the knitwear garment sector has maintained a steady pace of growth in its shipments and led the sector with an increase of 16.13% in its exports for October 2018. Pakistan’s overall textile exports were recorded at $1.13 billion in October, down 0.12% compared with $1.132 billion in the same month last year. However, the knitwear garment sector stood on top with the highest exports in the textile chain as well as in total national exports with a growth of 16% compared with October 2017. Knitwear garment exports grew 10.41% in July-October 2018 against the corresponding period of previous year. “Knitted garments have a great potential for expansion,” commented Pakistan Hosiery Manufacturers and Exporters Association (PHMA) Central Chairman Muhammad Jawed Bilwani. “The knitwear garment sector can achieve new milestones and its export can be enhanced by 25% every year, provided the government gives serious consideration to the proposals sought from the sector,” he said. The sector alone earned $2.719 billion for the country in fiscal year 2017-18, which included knitted products like hoodies, shirts, t-shirts, jerseys, pullovers, trousers, jackets, etc. The sector has ranked high in the textile group over the past three years. Bilwani termed it appreciable that the government was giving priority to five zero-rated export sectors – textile (including jute), carpet, leather, sports and surgical goods – and was also prioritising the export industry for the provision of uninterrupted gas supply with special tariffs, which was a longstanding demand of the PHMA. He was of the view that if the government considered the exporters’ proposals and resolved all their problems and issues, a breakthrough in exports could be easily achieved. He called exports the lifeline that would support and strengthen the national economy. He also demanded that the government consider and set separate electricity tariffs for the five zero-rated industries and introduce uniform tariffs for water consumption as well. Currently, water tariffs for the industries in Karachi were the highest when compared with other regions and provinces. Meanwhile, the PHMA has written a letter to the finance minister, requesting him to register all export-oriented textile manufacturers as zero-rated industries so that they could avail themselves of the facilities. “Many small and medium export-oriented industries are not registered as zero-rated in utility bills due to cumbersome tax payment procedures as they first pay sales tax and then apply for tax refund,” he said. On month-to-month basis, the exports increased by 31.25 percent in September 2018 as compared to the same month of last year. During the period from July to September 2018, exports of fruit and vegetables increased by 49.34 percent and 19.17 percent respectively. In first quarter, 130,747 tons of fruit worth $101.9 million were exported as compared to exports of 83,073 tons (at $68.2 million) in the same period last year. During the period under review, Pakistan also earned $16.1 million by exporting about 4,289 tons of spices, recorded at 3,558 tons and $13.4 million of same period of last year, registering an increase of 21.82 percent. Nasir Hussain, a resident of Landhi No. 6, worked in the banking sector for seven years before realising it wasn’t worth it. In 2014, he enrolled for a Master’s degree in computer science and taught part-time to run his kitchen. Fast forward to 2018, his services are in high demand both locally and internationally. Hussain teaches software development and artificial intelligence at Karachi’s reputable private universities because more people are signing up for these courses. In the evenings, he works as a freelance developer for online platforms, such as freelancer.com, upwork.com and fiverr.com. “When you can earn $2,000 from a project you can finish in one week, why bother about a fulltime job,” Hussain told Samaa Digital. Three years ago, Hussain teamed up with some other freelancers to provide IT services, such as mobile apps, software and web development. The work has grown significantly since then and they have now set their eyes on earning at $5,000 per month for each member of their team. Hussain’s team is part of a 200,000-strong nationwide network of freelance developers, who have been driving the country’s IT exports that have surpassed $1 billion just recently. Even that number is grossly understated because most of the payments to freelancers are recorded as remittances, not exports. According to industry experts, IT has the potential to be the second largest export industry after textile and become a major player in the $200 billion global market for IT services. If supported with the right policy and incentives, the sector can generate employment at a mass level, boost our exports and ease pressure from our dwindling dollar reserves. Pakistan is once again knocking the doors of the International Monetary Fund for a bailout since its dollar reserves have fallen sharply. The country’s imports are more than double its exports as for every dollar earned, it spends two. Fewer dollars means we may soon default on our foreign payments: import of oil, machinery for CPEC and repayment of foreign loans. The current level, $7.4 billion, of our foreign exchange reserves is barely enough for two months of imports. Experts are unanimous that increasing our exports is the only way Pakistan can come out of this crisis where it seeks the IMF’s help every few years. Textile sector, which constitutes more than half of our total exports, is always seen as our saviour. The Pakistan Tehreek-e-Insaf has also supported this sector in its policies during the first 100 days of their government. Textile sector’s contribution to the economy in terms of exports and employment can’t be ignored, but it is time the country took IT sector seriously because of its potential. India went on to develop its IT sector and became the powerhouse for outsourcing and freelance services. Their IT exports have now surpassed $125 billion, nearly 40% of our GDP. The Philippines also adopted policies that supported its IT sector. The South Eastern nation now exports $30 billion worth of IT services—more than our entire exports. On the other hand, Pakistan lagged behind because of poor, IT infrastructure, negative perception, and the shortage of skilled IT workforce. However, all of this has changed. Unlike past when there was only one subsea cable, the country now has six gateway points connecting it with the cyber world. The security situation has improved significantly and our universities are producing 20,000 IT graduates every year. According to a recent report, the product and services exports from the IT sector of Pakistan show less than expected growth this year. The recent report which comprises of export data taken from the first four months of the current fiscal year shows that the IT exports from Pakistan weren’t able to meet the expected growth rate targets. The statistics as made available through State Bank of Pakistan show that the growth in the Telecommunications, Computer, and Information Services sector of Pakistan stood at 5.34%, a rate which is lesser than what was originally being anticipated by the industry veterans. The export receipts from Pakistan stood at $355 million, during the first four months of the current financial year which started July. 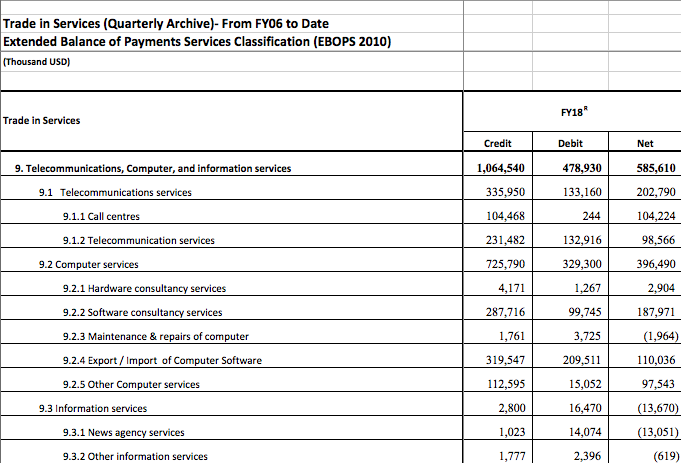 These receipts show a year-on-year increase in the IT-related exports standing at 5%. The exports value from the same period last year stood at $337 million. During the last year, the Pakistani IT exports had shown a growth of 13% during the whole financial year. On a rather good note, the IT-related imports showed a decline as more reliance went towards indigenous produce of ICT-related services and products. The imports have decreased from $163m to $147 showing a decrease of 9.8%. It must be mentioned here that the facts presented in this report account for the trades with receipts and apart from this a lot of informal trade also happens between Pakistan and the rest of the world. The lesser increase in the exports could be credited to decrease in the value of Pakistani rupee against the dollar. The rupee has depreciated greatly this year as the fiscal deficit in Pakistani reserves and trade increased as the financial year started. This means even if the amount of services/products from this category has increased, the, overall value of the exports didn’t progress much. The digital power of China’s Belt & Road Initiative (BRI) is slowly unfolding and shaping into a whole new area of opportunity. When the BRI took global centre stage in 2013, most conversations revolved around traditional infrastructure: building roads, railways, power sources and linking borders. However, the digital awakening that BRI brings, and the associated development of human capital and innovation, is much more powerful. The global map is being altered at a much faster rate than anticipated due to the disruption created by digital infrastructure, artificial intelligence, the Internet of Things, and blockchain. Further digital and technological disruption is now set to mend fractures in society – leading to improved living conditions and enhanced economic empowerment. This disruption has given new life to e-commerce and the start-up scene in BRI countries. In light of the Global Competitiveness Index 4.0, it is extremely important that economies grow in all areas, overcoming challenges and making investment in human capital and innovation. Resilience and agility are key. Looking at the South Asian region, some of the traditional deterrents to growth have been inadequate transport facilities, patchy power supplies and lack of financial inclusion. As we have seen in the past, industrial revolutions take their time to reach developing countries but the Fourth Industrial Revolution has been quick to reach all corners of the world. Billions of dollars of investment are bridging the infrastructure and power supply gap while improving technology – the goal is to look past the problems that have hindered the road to progress in countries along the BRI. The flagship project of the BRI, the China-Pakistan Economic Corridor (CPEC), which is a major collaboration between China and Pakistan, has been rapidly progressing and the impact of the project can be seen in the lives of Pakistani people, as reflected in an improving human development index. Pakistan, which is emerging from many years of the war on terror, is now on a decent path to progress, with economic growth of 5.8% and improved investor confidence. At the World Economic Forum in 2017, Ebay’s chief executive, Devin Wenig, highlighted Pakistan as one of the fastest growing e-commerce markets in the world. In 2018, Alibaba bought Pakistan’s largest e-commerce platform, Daraz.pk. ..... Ant Financial Services, China’s biggest online payment service provider, recently bought a 45% stake in Telenor Microfinance Bank, in a deal that valued the Pakistani bank at $410 million. Irfan Wahab, chief executive of Telenor Pakistan, called the deal a “game changer”; while Eric Jing, chief executive of Ant Financial, said it would provide “inclusive financial services in a transparent, safe, low-cost and efficient way to a largely unbanked and underbanked population in Pakistan”. This kind of investment will benefit from the significant demographic dividend in Pakistan, targeting the largely unbanked young population, and providing not only financial inclusion but also a base on which to build digital businesses. What the country needs now is to improve its position on the innovation and financial inclusion indices, currently at 89 and 75 respectively, on the World Economic Forum’s Competitiveness Index 2018. The rapid completion of CPEC projects and the use of digital technology in the process is disrupting the economy and the lives of people at the same time. The question is whether Pakistan’s leadership will choose to embrace these technologies and take advantage of the biggest project on the road to progress. The future is full of opportunities and promise. The advantage of investing in areas such as artificial intelligence is that no major investments are needed in terms of infrastructure or heavy machinery and the results can become visible within a few years. There is now a huge international demand for well-trained professionals in this field. Most advanced countries are searching for young trained professionals so that they can benefit from development taking place across the globe. Visa restrictions have been relaxed for these professionals. Artificial intelligence will find applications in almost every sphere of activity, ranging from industrial automation to defence, from surgical robots to stock-market assessment, and from driverless cars to agricultural sensors controlling fertilisers and pesticide inputs. Pakistan churns out about 22,000 computer-science graduates each year. With additional high-quality training, a significant portion of these graduates could be transformed into a small army of highly-skilled professionals who could develop a range of AI products and earn billions of dollars in exports. Another important step in developing a knowledge economy is to uplift our technical and vocational training centres while being mindful of the needs of industrial hubs that are to be set up under CPEC. There are over a thousand such centres, but they are in a bad state. If some of these centres are converted into high-quality technical training institutes for teachers in collaboration with Germany, China or other advanced countries, well-trained teachers can then be absorbed in the thousand or so technical training centres. This could contribute to industrial development. The Fourth Industrial Revolution is upon us with all of its challenges. We live in a world where truth has become far stranger than fiction. Each day brings thousands of new discoveries. Many of these discoveries are transforming our lives in numerous ways. The blind can now see using their tongue. Molecular scissors have been developed that allow genes to be cut from one species and transferred to another, resulting in new plant and animal species. Genes have been transferred from deep-sea jelly fishes to orchids to make flowers that glow in the dark. Nanotechnology is being employed to commercially purify water. Superfast gene-sequencing will allow the entire human genome to be sequenced in minutes. Objects can now be moved by thought control and driverless cars are being developed. We now have anti-ageing compounds that have been known to reduce the signs of ageing among mice. Children being born today are expected to live up to the age of 120 or more. 3D-printing is being used to produce parts of human livers and kidneys. Stem cells promise to cure damaged organs and may change the manner in which medicine will be practised in the future. Our own work on the molecular basis of thought processes has provided exciting insights into the functioning of the human brain – arguably the most complex object in our universe, with 100 billion neurons in a brain, each neuron communicating with some 10,000 other neurons. This work has led to new approaches to treat Parkinson’s disease. A knowledge economy requires a different approach to socioeconomic development than that adopted by Pakistan so far. It needs to rely on carefully crafted policies and the development of knowledge and skills in selected fields for inclusive sustainable socioeconomic development. The formation of a taskforce to strengthen knowledge economy represents one of the most important developments in the history of Pakistan. The PMmust be congratulated for focusing on this critical area. The challenge now lies in the efficient implementation of the taskforce’s recommendations.